Our various accomplishments on intelligent medical devices (IMD) confered us an expertise that is renown world wide in the field of electronics dedicated to biomedical applications. These achievements allowed us to develop a thorough knowledge of mixed (analog/digital) circuits and systems in both discrete and integrated electronics. Assemblies and encapsulation of electric implant. For the biomedical implantable applications, inductive link has been widely used for both power and data transferring. One major problem of the existing design is the low power transfer efficiency due to the weak coupling. One power regulation loop is established to adjust the sending power in a dynamic way. This power regulation loop is based on a reliable, efficient data communication between the implant and the external controller. BPSK and LSK modulation methods are used for data downlink and uplink respectively. Three crucial blocks of this wireless interface (power recovery module, A/D converter and BPSK demodulator) have been implemented in CMOS 0.18 um technology. Experimental result is expected to be provided soon. System assembly and integration in several applications constitute the next step of this project. In order to accurately diagnose respiratory dysfunction, a physician can resort to the assessment of the electrical activity of the diaphragm (diaphragm electromyogram - EMGdi) and to its physical strength (trans- diaphragmatic pressure Pdi). We are proposing a new catheter mounted system combining the assessment of the EMGdi and the Pdi. The system is based on two silicon micro machined pressure sensors (micro electromechanical systems - MEMS) and a new esophageal electrode geometry. The new electrode is intended to naturally filter the cardiac artifact without the use of complex mathematical techniques currently employed. Signal processing and digitizing are madelocally to minimize noise injection. Data is transferred via a high bandwidth 2,4GHz BluetoothTM wireless connexion. The entire systems must be integrated in a 5mm diameter catheter. Electro-magnetic simulations of the new electrodes have shown good results in relation with the cardiac artifact rejection. A MEMS piezoresistive pressure sensor has been realized in 1,5um CMOS technology. A prototype of catheter including the new electrodes has been made in order to validate the results obtained in simulation. The new catheters will be tested on humans in order to compare with the present model. The low noise data acquisition system is being designed with 0,18um CMOS and according to the latest noise reduction techniques. A bonding method is being tested in order to attach the silicon pressure sensors over the flexible printed board circuit required in an application such as a catheter. Spinal-cord injury produces incontinence and, or retention due to lower urinary tract deficiency. Repetitive catheterizations induce multiples complications at several levels (Sphincter, bladder and kidneys). The bladder hyperreflexia (simultaneous contractions of the bladder and the sphincter) is hardly curable with traditional Medicine. Reported solution for the recuperation of the bladder function is electrical stimulation. But conventional electrical neuronal stimulation (ENS) of the bladder induces contraction on both detrusor and sphincter, thus preventing from complete voiding while conventional ENS combined with nerve rhizothomy is not accepted by patients. Our team proposed dual electrical stimulation technique: Selective neuronal stimulation allows efficient voiding of the bladder, and Permanent low frequency to reduce or even suppress hyperreflexia symptoms and maintain the bladder shape. The stimulation techniques corresponding devices have been designed and realised by our team: a selective stimulator and a dual implantable stimulator. The next step is going toward total integration. A new integrated stimulator has been designed to allow voluntary bladder voiding, suppress hyperreflexia symptoms and monitor the nerve impedance. Impedance measurement is commonly used to characterize electrodes-tissues contacts in implantable stimulators. Also, a new selective stimulation technique allow the generation of waveforms created with multiple stimulation patterns. Each pattern is created using previously programmed amplitude values with variable pulse widths and frequencies. The chip has been fabricated in a CMOS 0.18um process and occupies 4mm2. The preliminary experimental results proved most parts of its functionality. Neural processes under-lying vision could be better understood with the help of a Brain Computer Interface (BCI) that could acquire and process the activity of a large number of visual area cells in real time. A fully implantable cortical data acquisition system (CDAS) achieving high quality multichannel recording is needed to acquire signals from cortical cells. The proposed system architecture uses new circuits techniques to meet tight power consumption constraints, small area, and low noise requirements of neural amplification. The implantable microsystem includes: a microelectrode array connected to the circuits using flip-chip technology; an analog front-end per channel to limit noise and DC offset; a wavelet transform signal processor to compress and improve precision of extracellular signals detection; An analog to digital converter. The action potentials recorded from the visual area's neurons are transmitted outside the body using an inductive telemetry link to a computer for data analysis. Reported preliminary results demonstrate the ability to build an acquisition channel with a power budget of few dozens of microwatts and minimal input referred noise. The front-end and the wavelet processor have been implemented in a 0.18 um CMOS process. Further research work includes in-vivo testing of the prototypes and experimental data analysis. Every year, in the United Stated only, about 260 000 people undergo lower-limb amputations. Victhom human bionics, is now well known for having developed the world’s premiere bionic leg. The motorized prosthesis is currently relying on external sensor information. The NeuroElectronic Sensor, developed by Polystim collaboration with Victhom and aimed at precision control of the bionic leg by lower limbs neural activity inter-pretation, is composed of an external controller and an implantable sensor. In the descending communication direction, the user sets the operation parameters through dedicated software and initiates a programming sequence. Instructions are sent down to the external controller and the implantable sensor through a USB link and the bidirectional RF communication channel. Once setup, the sensor acquires data and returns the requested information upwards. The mixed-signal implantable part of the system, powered by the inductive RF coupling link, requires miniaturized, reliable and low-power circuitry which must include a low-noise amplifier, filters, a programmable gain OpAmp and analog-to-digital converter (ADC) as well as the digital circuitry needed for control and duplex communication. Prototypes realized using commercially available components have tested the selected architecture and proven the feasibility of the project while the integration on chip process is under way. The approach chosen by Polystim requires a reliable brain/device interface adapted to an environment that is as harsh as it is delicate. In order to stimulate the cortex and produce well-defined bright spots with low currents, the best procedure is to use microelectrode arrays that penetrate the brain to a depth of ~ 1.5 mm. These electrodes must show low electrical impedance, excellent biocompatibility and good mechanical strength despite their high aspect ratio. Our arrays are machined from bulk stainless steel or titanium by an EDM process. The surface of the metal is then electrochemically treated prior to the deposition of the platinum stimulation sites at the tip of the electrodes. An insulating epoxy base and a biocompatible coating complete the fabrication of the steps. Several microelectrode arrays are now being built for in-vivo testing. The first implantation results and the great flexibility of our device will allow fast optimization of its properties. Since the stimulation cannot result in a high quality image, some modifications of the acquired image have to be done for the patient to help understand what he sees. Enhancements are performed by processing the captured image and 3D information of this image is calculated by a range finder system. Image acquisition is done by a CMOS image sensor constituted of an array of digital pixel sensors. The 3D information of the image is calculated by a range finder system, which emits a pattern of infrared light via a micro-mirrors array, to sense it by an image sensor. The distance calculation, based on triangulation principles, can then be performed. Images of the outside world have to be represented as phosphenes patterns (bright spots in the subject’s vision field). The 3 basic processing steps are: - preprocessing (e.g. Histogram equalization); - processing (e.g. Segmentation, thresholding); - pitting to phosphene map. Different effects are available, depending on situation : reading, inside/outside displacement, etc. Over 4M people in the western world are blind, with more than 25 000 new cases yearly. The desire “to see” and better function in their world is pervasive and common across the world’s blind. We are pursuing the goal of creating a wireless intra-cortical visual prosthesis. This device consists of an image acquisition and a processing system that transmits instructions wirelessly to an implanted stimulator directly interfacing the visual cortex of the brain. The implanted part of the system itself consists of a central module which task is to retreive, from the radio-frequency signal, the power and data required for a multitude of micro-stimulators to properly induce sensations of bright spots in the subject’s field of vision. For this, high performance, low power and highly reliable components have to be designed and implemented. To date, efficient power recovery and demodulator circuitry have been designed and proven its functionality. An entirely integrated stimulator, including a flexible digital controller with configurable communication protocol, versatile current generators and low power monitoring circuits have been successfully imple-mented in 0.18 um CMOS process. Experimental in vivo validation is expected to begin in the coming steps through partnership with a research team at the Montreal Neurological Institute, McGill University. Losing an eye is devestating at any age. So replacing the lost eye with a naturally looking one will have a great impact on the self image and self confidence of the person. In this work, a display simulating the human iris along with a controller to control the size of the simulated pupil is designed. So according to ambient light the prosthetic pupil will appear either contracted or dilated to give the look of a natural eye. This system has a 12 mm diameter, the size of the human iris. The controller was implemented in CMOS 0.18 um process, having a total area of 1.3 mm2. The integer-N frequency synthesizer of the RF transceiver of the Wireless platform has been implemented using a 90-nm CMOS process and is currently under fabrication. Electromyogram (EMGdi) is used in various circumstances such as diagnostic and prosthesis control. Howevever, recorded EMGdi signals are always contaminated by electrocardiogram (ECG). Cancellation of the ECG contamination, expecially in real-time, is not a simple operation because the spectra of EMG and ECG overlap. 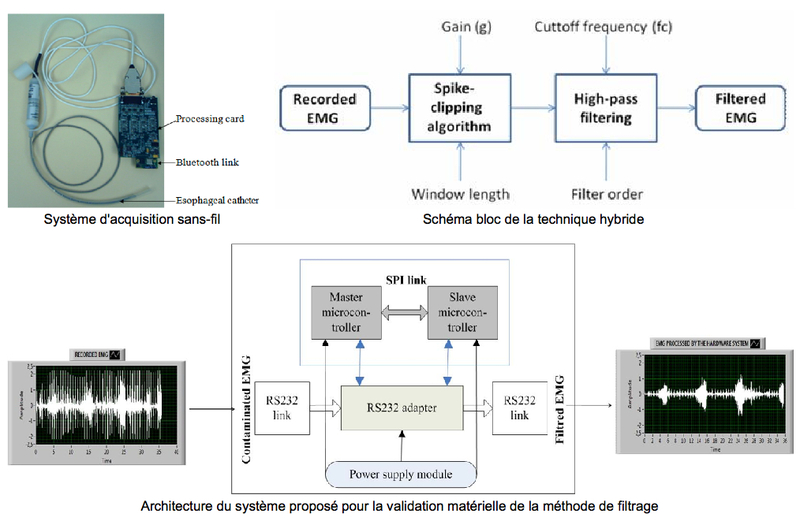 In this project, we propose a hardware implementation to validate a EMGdi real-time filtering technique that will be integrated to a wireless esophageal catheter which records EMGdi and Pdi. EMGdi recording system: The acquisition of EMGdi with the EMGdi recording system (figure 1) can be summarized as follows: a 2 mm diameter catheter is inserted through the esophagus down to the stomach. Five EMG platinum ring electrodes with an inter-electrode distance of 1.5 cm and a wide of 2 mm are fixed in this catheter. The low amplitude EMG signals acquired by the ring electrodes were first amplified and conditioned by an external card. Then the EMG signal was digitalized by a 16 bits analog to digital converter (ADC). Finally, the EMGdi samples were processed by two microcontrollers which form frames and sent them through a Bluetooth link to a PC host for recording. The implemented hybrid technique: The hybrid technique (figure 2) combines a spike-clipping algorithm and a high-pass Butterworth filter. The spike clipping algorithm is based on an adaptive threshold which depends on the values of a number of previous points and a gain fixed by the user. 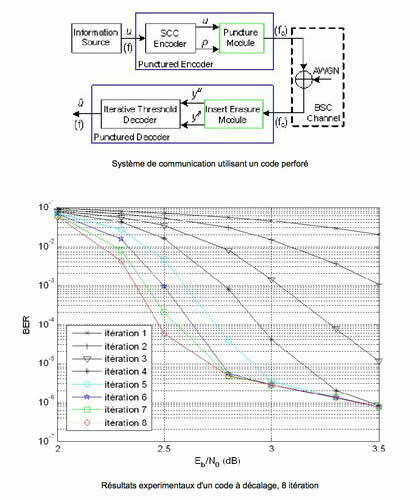 Iterative threshold decoding of Convolutional Self-Doubly Orthogonal codes (CSO2C), can provide a very attractive trade-off between hardware implementation complexity, decoding latency and error performances making this error control coding scheme suitable for applications to high speed wireless communication system. Pipeline Strategies: Two pipeline strategies was developed and applied in order to increase the throughput of the threshold decoder. The Pipeline Capability is introduced as an additional constraint for the search of optimal CSO2C codes characterized by very high throughput and low complexity at the decoding stage. Punctured CSO2C Codes: In order to implement the punctured encoder and the corresponding decoder, a Puncture Module and an Insert Erasure Module as well as an elaborate Clock Manager module was developed and integrated in the communication system. All of these modules support compatible-rates codes. Prototyping and Experimental Results: The communication system was prototyped using the ARM Integrator platform. The décoder throughput reached 265 Mbps for Single Shift Register Codes and 1 Gbps for 5-Shift Registers Codes. A mixed-signal data acquisition IC with conditioning and digitization. A digital IC for control and digital signal processing. A wireless interface IC to transfer data supplies energy. 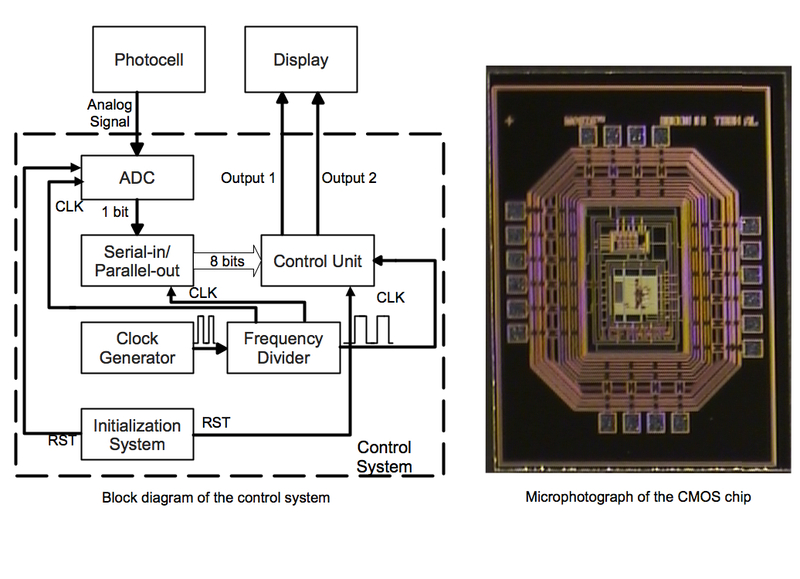 A 16-channel multi-chip prototype including different processing ICs has been implemented in a CMOS 0.18-μm process. It dissipates 138 μW per channel and has a surface of 2.3 mm2. In-vivo testing of the prototype is in progress.